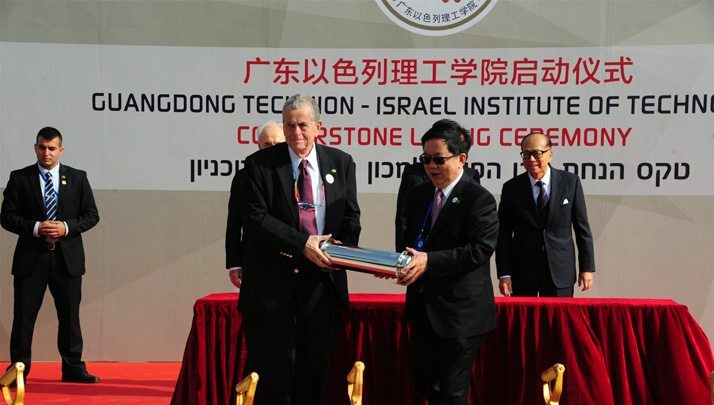 In an exciting ceremony attended by Shimon Peres (former Israeli president) and Aaron Ciechanover (Chemistry Nobel Prize laureate), the Chinese Government placed the corner stone for the new Technion campus in China. An unprecendeted initiative, the new campus is the fruit of a collaboration between the Technion, one of Israel’s leading technological institutes, the Chinese Government, and Shantau University. The new campus, dubbed TGIIT for short, will offer groundbreaking opportunities for ideas exchange between Israeli and Chinese scholars. TGIIT is the first Israeli institute for higher education in China, and its launch constitutes nothing short of a historical event. After winning a competition, Mochly-Eldar Architects is designing the new campus, (over 110,000 SQM in size), which houses a multitude of programs, including dormitories, laboratories and research facilities.